Burnetts Solicitors provides grounded and expert legal advice to individuals, businesses and the public sector. Our nationally recognised and accredited teams of lawyers are based in Carlisle, Cockermouth, Penrith and Newcastle. Burnetts Solicitors is one of the largest law firms in Northern England, but our growth is not just down to our nationally recognised legal expertise: our real strength is in our approachable and accessible lawyers who are genuinely committed to looking after your interests, be they professional or personal. What’s more, our twin centres in Carlisle and Newcastle guarantee expert advice, tempered by good measures of Cumbrian nous and Geordie humour. Our legal services for business and the public sector include advice from nationally recognised solicitors on: commercial property, construction and procurement, planning law, employment law & HR, dispute resolution, landlord and tenant, debt recovery and company commercial issues. Burnetts Solicitors has a particular specialism in education law. For private clients, our accredited teams of lawyers provide advice on: family law issues like relationships and children; will writing and trust creation; buying and selling houses and dispute resolution. Burnetts also has a team of specialist medical negligence solicitors, advising nationwide on cases of clinical negligence and a serious injury team with a particular expertise in compensation claims for catastrophic head injuries. Agricultural law is another area of expertise: Burnetts has a team of expert solicitors who help farmers and other landowners with buying and selling farms, partnership issues and mines and minerals issues. Burnetts is accredited by the Law Society for the quality of our advice and service in conveyancing, medical negligence, personal injury and children law. You can see a full list of our accreditations here. 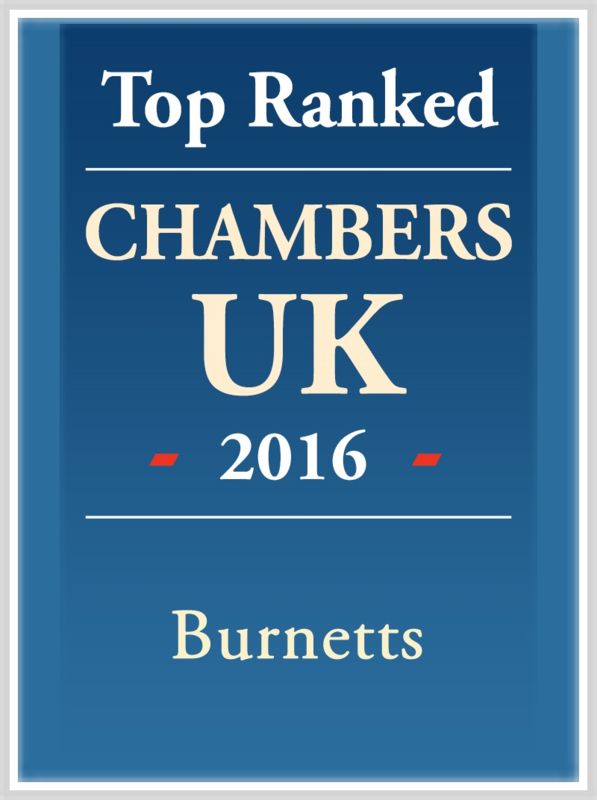 Burnetts' solicitors have also been recognised by prestigious national guides to the legal profession such as Legal 500 and Chambers & Partners. Whether you’re setting up a company, breaking up from a relationship, managing a poor performer or buying a new home, our solicitors will be beside you until the job is done.